Begin your adventure with these incredible animals- learn to care for, feed, wash and even swim with elephants. They are sure to become your new best friends. I contacted the organization and asked a lot of questions as I didn’t want to end up in a tourist camp where the elephants are used for entertainment or for trekking, carrying an heavy platform and tourists on their backs. I learned that we would be living in a village where the residents had elephants but that we would be helping with community projects, that the community as a whole would benefit economically, and that as a result, villagers would not have to take their elephants to beg in the cities in order to support their families. I had dismissed the idea, but part of me wanted to know how the elephants were kept and taken care of. After weighing the pros and the cons I decided to find out for myself and signed up. Along with 14 women from Canada, the US, England and Australia, I spent five days in a village of approximately 300 people. As we were entering the village, we could see that many houses had an elephant in the backyard. The house we stayed at was no exception. In addition to half a dozen dogs rescued by the on site project coordinators, there were two elephants chained in the backyard: Bank, a 14-year old female and her 4-year old baby Wondee, and I wondered if I had made a mistake. In Thailand, elephants were trained to work in the logging industry, a work for which they were very good. But it meant that generations of elephants could not be just elephants. They were forced to work long hours, sometimes to exhaustion, were often beaten, and sometimes deprived of food and water. When logging was prohibited in Thailand in 1989, thousands of “domestic” elephants lost their jobs. Therefore their mahouts (the people who cared for them) lost their income and, in addition to their families, they still had to care for and feed their elephants. This created huge economic problems for the population. With no jobs, how could they find money to feed their elephants. Some mahouts took them to the nearest cities to beg or joined the numerous elephant parks that provide trekking or rides to visitors so they would be able to provide for their families. The mahouts have strong bonds with their elephants. They consider them like a member of the family, just as we do with our cats and dogs. There is a deep cultural and religious history that reveres the elephants. Statues of elephants are everywhere. In the villages, in the cities and in the temples. Being a Mahout also commands respect. The profession is passed on from generation to generation, and often an elephant would have the same mahout for his whole life. The financial contribution provided by the volunteers staying in the village helps all the villagers. Most families own an elephant and the financial assistance means they don’t need to take their elephants to the city to beg or to work in a riding camp for tourists. Yes, it pained me to know that we had two elephants chained in the backyard. On the positive side, funds had been raised to build them a larger enclosure where both elephants would have more space to move around. In the meantime, Bank is rocking back and forth and Wondee is already showing signs of stress. Yes, it bothered me that the mahouts carry a bull hook. But when we had a close call and one of the volunteers was nearly ran over by two rambunctious babies, the mahout was quick to pull her to safety and didn’t use his bull hook. Yes, it bothered me that when we took 17 elephants for a walk, we were holding a chain. I was pleased however that mahouts are encouraged to walk beside their elephants rather than riding them. We learned that a “domesticated” elephant is still a wild elephant. We learned to respect their space, not to approach them from the front, and to never go close without the mahout being present. All the elephants I have seen up close in the village, seemed to be well treated, did not have any open wounds or sores and are seen by a vet once a month. I mentioned Bank and her baby Wondee. Her owner/mahout wants to breed her again. He has two daughters and wants to give them an elephant each. This is something I could not understand. Why are we continuing to breed these elephants? Apparently, the daughters want their elephant. Why? What are they going to do? How are they going to feed them? Where are they going to keep them? This is a tradition in Thailand and maybe they feel they cannot refuse because of the respect young people have for and show their parents. I came back with more questions than answers. If our being there doing community projects, such as painting the school, helping at the Elephant Dung Paper Project (yes they make paper out of elephant poo), and cutting bamboo to feed them before and after their bath, prevents elephants to be used (and abused) in tourist camps, then maybe it is a step in the right direction. Or are we enabling the villagers to continue with their traditions. 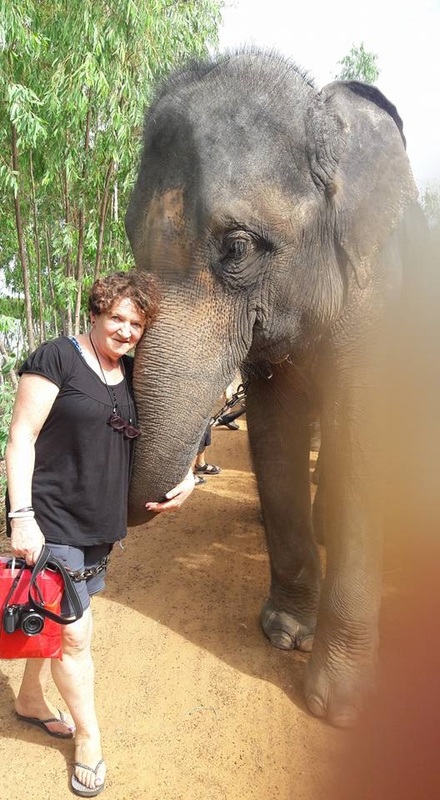 Twice that week, I walked with a 16-year old elephant named Kum Lai. She was beautiful. As we walked down the path to the river for her bath, I spoke to her, told her she was beautiful and apologized for what we, humans, have done to her species. She kept looking at me through her long eye lashes and I know she understood me. Don’t ride elephants. Interact with them on an ethical elephant adventure!